Our pelvis plays an important role in how we stand, sit, and perform in many movements. It also plays a vital role in maintaining our posture. When it comes to maintaining a good posture, our goal is to get the spine in a neutral position. Our spine has a natural gentle "S" shape. A neutral spinal position, refers to the natural curves of a healthy spine. What our pelvis and hips are doing is very important to our overall posture. 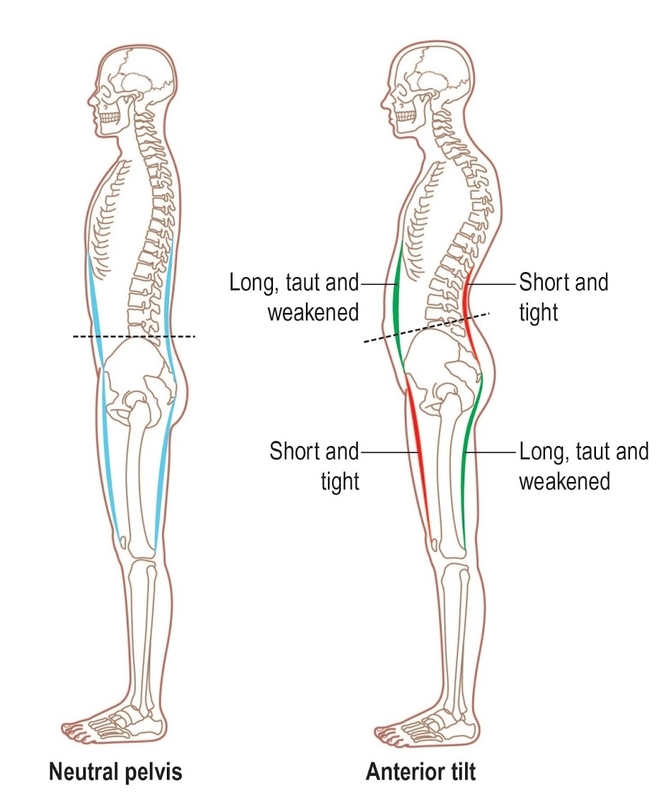 When we stand, sit, or walk, we want our spine and pelvis to remain in a neutral position. People who spend a large portion of their day sitting are more likely to develop an anterior pelvic tilt over time. An anterior pelvic tilt is a common postural issue in both men and women and occurs when the front of the pelvis is tilted excessively forward, while the back of the pelvis is raised. An anterior tilt can cause to much curve in the lumbar spine, or low back. It is normal for both males and females to have a slight anterior (forward) pelvic tilt, of about 6-7 degrees. This is because of how the pelvis bones are shaped. When the tilt is greater than 6-7 degrees, or whenever an excessively forward tilted pelvis causes pain is when is the time to be concerned. What causes an anterior pelvic tilt? It is important to remember that the musculoskeletal system is very complex and each individual is different. There are many different factors that could cause an anterior pelvic tilt, and having one does not always result in pain. A physiotherapist can help assess your overall posture if you are experiencing any kind of pain or muscle stiffness. People who have jobs that involve sitting for most of the workday are typically more likely to develop an anterior pelvic tilt. Weak muscles in the core and glutes contribute to the pelvis tilting forward during a everyday posture. Because the pelvis is tilted forward excessively, muscles of the hip flexors (front of hip) and low back will likely become very tight. One study showed a relationship between individuals who had a anterior pelvic tilt of greater than 7 degree's and disability from low back pain (Lim, Roh & Lee, 2016). Come on in for a session with one of our kinesiologists or physiotherapists, if you are experiencing pain or would like to improve your posture! Newer PostWhat exactly are your "glutes"